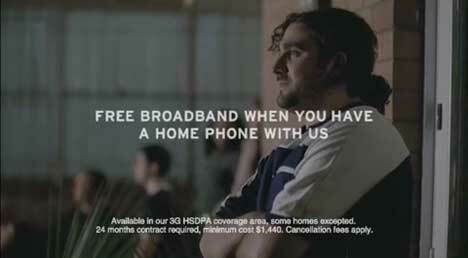 Virgin Mobile has launched a new wireless broadband service in Australia, using a TV ad featuring online video projected on city buildings. The Virgin Broadband TV ad begins with images from the Numa Numa online video projected onto buildings on a dark night in the city. Familiar imagery from YouTube virals appear on buildings, trees and faces. The ad reaches its high point with a crowd gathering to watch Jud Laipply perform his Evolution of Dance on the side of an apartment block. More and more people are drawn out of their homes, onto their lawns and balconies to watch the light show. 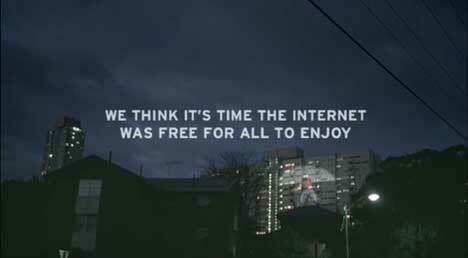 The laughing, smiling faces of the crowd give way to the strapline: “We think it’s time the internet was free for all to enjoy”, and the promise of “Free Internet”. The Virgin Broadband projection ad was developed by advertising agency Host, Sydney/The Glue Society (via Radical Media) by art directors James Dive and Gary Freedman, copywriters James Harvey and Jonathan Kneebone, executive producer Rob Galluzzo, producer Peter Kearney, director of photography Danny Ruhlmann and editor Bernard Garry (The Editors).